The guardians of the first Bell of Awakening. After the first gargoyle's HP drops below 60%, a second, fire-breathing one will come to the boss arena. Generally the first boss encounter in which you can summon NPC phantoms. On the rooftop of the main church building. In front of the fog gate, you can't miss it. You must have opened his cell cage (requires Mystery Key or Master Key), which is nearby the fog gate, down the right hallway and then talked to him at the Firelink Shrine to be able to summon him. His Soul Sign is behind the first ladder, proceeding up to the fog gate, on a ledge. 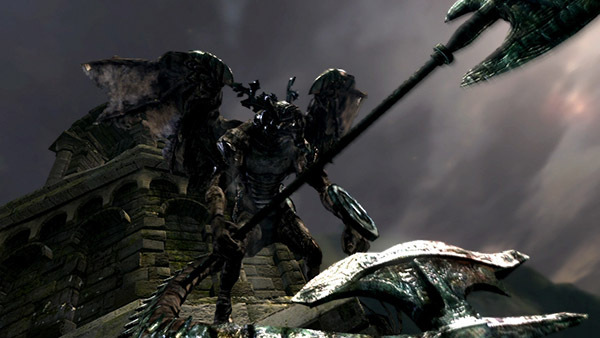 There are two similar Gargoyles in Anor Londo, both of which drop the same items and the first of which can have his tail cut for a total of two Gargoyle Tail Axes per play-through. You can actually farm the 2 Gargoyles at the Church if you want to get their drops. When you enter through the fog, weaken the first Gargoyle to near death. Wait until the second Gargoyle shows up then kill the first one. Grab any loot if any dropped and then Quit Game. You will appear outside the fog and can repeat the process until you get what you want. Summoned allies can run to the other side of the roof without triggering the fight. Waiting for them to go to the other side can let you surround the first gargoyle before the fight begins. Horizontal Combo - Up to three horizontal swipes with his halberd. Thrust Attack - Thrusts his halberd at the player. Shield Bash - Bashes the player with his shield. Overhead Smash - An overhead strike with his halberd, can be one-handed or two-handed. 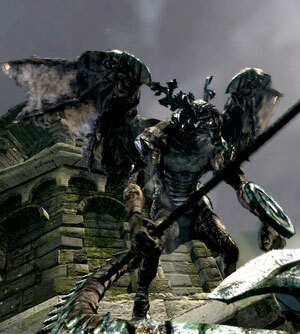 Flying Overhead Smash - Flies into the air and quickly descends towards the player with an overhead attack with his halberd. Tail Uppercut - Flies into the air and swings his tail upwards at the player. Requires a tail so only the first can use it until you cut his tail off. Halberd Uppercut - Flies into the air and swings his halberd up at the player. Flying Swipe - Flies into the air and towards the player, attempting to land behind them, twists in the air and upon landing does a swipe with his halberd in the direction he came from. Sweeping Breath Attack - Breathes fire in an arc in front of him. Both Gargoyles can use this, but the first will only do so after the second arrives. Flying Breath Attack - Flies into the air and breathes fire down at the player. May appear to start an overhead smash but use this instead. Both Gargoyles can use this, but the first will only do so after the second arrives. Note that the second Gargoyle has the same moveset, but will almost solely use the sweeping breath attack. Similarly the first Gargoyle can use breath attacks (after the second has joined him), but will prefer to attack with his halberd. Everything except the breath attacks can be blocked with relative ease using a Normal Shield, although the overhead attacks may consume a lot of stamina. Blocking a breath attack will significantly reduce the damage depending on the fire resistance of your shield but be careful of the other Gargoyle as if he hits you while blocking a breath attack you will likely be staggered and take full damage from the fire. The Heater Shield, or Hollow Soldier Shield are easily obtainable and ideal for this fight. Note that while blocking you will still be knocked back a little way so stay away from the edge of the roof. Always try to be moving towards the peak at the middle. His attacks are well telegraphed so rolling through them is relatively simple, just roll into each swing or sideways as he uses a vertical attack. His horizontal combo has a wide sweep but getting directly behind him will avoid it altogether. If he flies into the air you are safest moving back although with a little practice he can still be dodged. Once the second Gargoyle joins the fight it becomes a little trickier. The new Gargoyle will mainly use slow breath attacks that have a long range so you will find yourself limited in movement. It is even more important to remain as close to the middle of the roof as possible so you do not get caught between the edge and a wall of fire. The sweeping breath attack is easily dodged by running to your left while facing the Gargoyle to get behind him. He will continue the lengthy attack until it is finished allowing for a large window to counter. Keep them both on your screen, avoid the fire as much as possible and attack when at least one of them is locked up in a breath attack (and you are not in danger of being hit by it). Highly recommend getting the Drake Sword for this fight, you will be able to kill the first Gargoyle before the second even hits the roof. Roll or block his attacks to get behind him and hack away at the base of his tail, you are mostly safe here and will get his tail axe as a bonus. Be careful engaging him after he lands from a flying attack as the window for attacking him then is relatively small. Note if he is higher up on the roof, your attacks will often pass under him. Try to engage him at the same level or higher up the roof to avoid this. Additionally being lower them him increases the risk of being thrown off the edge by blocking or failing a dodge. As always watch your stamina while attacking him as you need to be ready for his next attack. If you are blocking, make note of how much stamina he takes off and ensure you do not fall below that much while attacking. If the second Gargoyle arrives before you kill the first, keep them both on your screen, DO NOT get surrounded by them. Bait out their attacks and get in attacks where you can, don't get yourself between them and the edge wherever possible and if you get backed up against a wall, carefully circle around them. It may be worth staying just to one side of the peak to allow for more room to circle around. Jumping attacks (Forward + R2) allow you to quickly get into range and attack if you are having trouble finding windows. The sloped roof can be a tricky ground to navigate as it is reasonably narrow considering the size of the Gargoyles and how far you can be knocked back. Always try to be on the same level, not only so your attacks will hit (if using a melee weapon) but so that if you are knocked back you can only go so far as either wall. Note if you do get below or above him his attacks will often miss but this is dangerous to rely on due to the knock-back. A ranged Sorcerer can utilize spells at range for a simple fight, walk or backstep away from any attack and follow up with a Soul Arrow. If he is flying, wait for him to land as he will usually duck under it. When the second Gargoyle joins, do the same thing, bait each into an attack, step back and hit them. A Pyromancer can utilize the above strategy with the first Gargoyle but the second is more resistant to fire so bringing a melee weapon to finish it is advised. Ranged strategies are particularly effective if summoning Solaire of Astora (not recommended to summon both phantoms due to the increased boss HP) as he will distract the Gargoyle while you bombard him with attacks. Melee builds may also benefit but will still need to be wary of the wide sweep attacks, flying attacks, and the Gargoyle(s) changing targets. In case of the Bell Gargoyles, the tail has about 7.81% of the Gargoyle's HP.